This model got a lot of five-star ratings from verified purchasers, many of them are not even skateboarders. Several reviewers shared that they are very satisfied with the amount of comfort that the Nike SB Stefan Janoski Max Mid gives them. Some reviewers loved that fact that this model easily goes well with casual pieces such as jeans and shirts. Many expressed adoration for this pair’s aesthetic appeal, with some saying that they get compliments when they go out in their Stefan Janoski Max Mid. Some reviewers appreciated the lightness of this pair. The Nike SB Stefan Janoski Max Mid comes in several colorways. This pair of skateboarding shoes can be copped off at an affordable sale price of less than $90. Some of those who already own a pair of these skateboarding shoes expressed willingness to buy at least another pair, this time in a different colorway. A reviewer took note of how easy it is to keep this pair of shoes clean. There were a few who mentioned that the Nike SB Stefan Janoski Max Mid is too narrow for their foot. There were mentions of how this model is poorly put together, with some material already peeling off after just a few days. Even if it is from Nike’s line for skateboarders, the Nike SB Stefan Janoski Max Mid has been able to maintain a fan base that includes everyday people who appreciate the comfort that it provides. A lot of them also love the pair’s overall aesthetic appeal and flexibility. At its sale price of less than $90 a pair, the Janoski Max Mid is in many ways a great offer. Though known for its athletic leanings, Nike did not actually have its own line of skateboarding shoes until 2002 when the Nike SB was launched. Since then, the line has partnered with well-known skateboarders like P-Rod, Eric Koston, Lance Mountain, and Stefan Janoski to endorse and produce shoes that make undeniable ripples in the market. Stefan Janoski, the switchstance king, released his first signature shoe through Nike SB in 2009. It was known as the Zoom Stefan Janoski, and it became the first shoe from the line to be made with a vulcanized sole instead of the usual cupsole. He simply wanted function over comfort, this is how Stefan himself explains the switch. A vulcanized sole, after all, provides better board feel. The Janoski Zoom enjoyed tremendous success. In fact, it helped thrust Nike SB’s influence from the confines of skateboarding culture to the more enveloping embrace of the mainstream sneaker frenzy. Because of this, it did not anymore come as a surprise when the Stefan Janoski Max, an offshoot of the Janoski Zoom, was released in 2014 bearing all the features that the mainstream market demands. The Max brought back the cupsole and it used breathable mesh on the upper. To top it all off, the Janoski Max also used the Max Air on the insole to provide superior comfort. Perhaps it’s quite obvious now where the model got its name. It’s as if announcing that its hallmark offer is comfort once more. It was in late 2015 when the Nike SB Stefan Janoski Max Mid was released. More than just a mid-cut version of its immediate predecessor, the Janoski Max Mid changed the upper from mesh to tweed. It also had TPU paneling that covers the toe and heel areas, adding an extra layer of water-resistant protection. Since its release, the Nike SB Stefan Janoski Max Mid has been re-imagined in various colorways. Given such engagement and exuberance, it’s clear that the Janoski Max Mid won’t be phased out any time soon. As one of the models that mark the rise of Nike SB’s influence in the mainstream market, it comes as no surprise that this shoe bears the style and color that most buyers want. Its sharp design surely doesn’t arrive unnoticed, and its flexibility certainly does not come unappreciated. The Nike SB Stefan Janoski Max Mid can be worn by both men and women. Both sexes can choose from sizes 4 to 13. This model comes in a standard width. 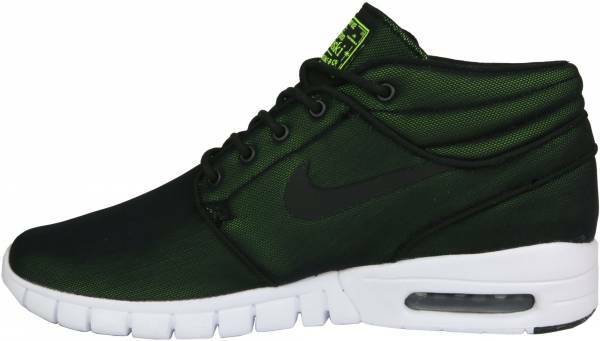 With comfort as its most important offer, the Nike SB Stefan Janoski Max Mid is known for its use of the Air Max on the insole. The switch from vulcanized material to cupsole is also noteworthy. When it comes to looks, the TPU paneling on the toe and heel areas effectively sets the Janoski Max Mid apart from the Max. Its use of the tweed on the upper is also a unique move. The Nike SB Stefan Janoski Max Mid has deep horizontal and vertical flex grooves that allow for a more natural range of motion. The model has an additional foam sockliner to maximize the wearer’s experience of comfort. The outsole has rubber pods that feature a herringbone pattern to provide adequate board feel.